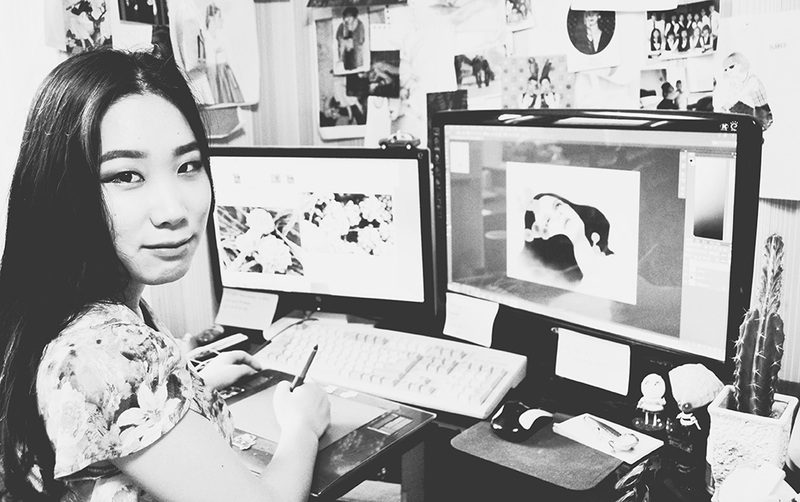 Dani Soon’s education was initially production and film led, but she chose to work within illustration – lucky for us! Feminine, digital, delicate, flat, contemplative. If I didn’t become an illustrator, I think I would’ve worked in the film industry. I studied film and production design during school and I like films very much. But I think I would’ve been better suited to archiving or film studies rather than making films on my own. I love most of my personal work because I draw what I want to draw. My favourite project from commercial works is a package work by a health supplement company. It was based on a vintage pinup girl concept. Although I didn’t have that much time to work on it, the image that my client wanted was very clear from the beginning, the pay was reasonable and fair, and I was paid right on time without any delay. Eyeglasses. I cannot work on any projects without my glasses on. Post-its. I don’t have a good memory, so I tend to forget things very easily if I don’t write them down on post-its. The most important thing is my computer, because I mostly work on my projects using computer graphic tools. I sometimes write a synopsis or scenario that people don’t know, though those who read them tell me they’re dull and not that interesting. Since I’ve spent most of my life in a small suburb in Korea, being part of an agency feels as if I am expanding the horizon of my works to the world. How have you seen your style develop during the entire time you’ve been an illustrator? I think it took me about 2-3 years. Before then, I had admired Japanese pop artist Nara Yoshimoto so much that I used to draw people like characters. I first imagine the complete image in my head. After creating the image in my head, I just need to start drawing it toward completion. This is sometimes easy, but other times it is very difficult to imagine the complete image in my head and it takes very long. Every day is similar because I like having regular daily routine. I don’t really like changes in daily life. Since I used to be a student not long ago, most of my daily schedule was focused on school. I worked on my projects while attending school from time to time. These days, I wake up in the morning, watch news while eating breakfast, and drink coffee right after. I work on my project until noon while drinking coffee and have lunch. Then I drink my second coffee and work on my project until the evening. I check my e-mails right away even while working thanks to my smartphone. When I finish eating dinner I play with my puppy or have some rest and workout for an hour. After then, I take a shower and do additional work if necessary, or look up some information on the internet. And then I go to bed and start it all again. I work as a freelancer because I’m a bit busy these days, but my daily schedule is similar to people working in an office. But, when I am free, I wake up around the noon and work fully on my individual projects, read a book, or go to an exhibition. Your work has a vintage feel, is there a certain time period or art movement you pull inspiration from? I’ve got much influence from works like ‘Golden Age of Illustration,’ the illustrations by Jessie Willcox Smith. I prefer delicate, subtle, dense forms to modern and simple forms. How do your hobbies and interests inform your work? I studied film and am very interested in films, so I sometimes attempt to incorporate narrative into a single piece of illustration, probably because of this influence. Also, since I’ve lived in the era of digitalized media I think a lot about digital paintings, which are copies without an original and is one of countless copies from the beginning.